Watch James Carville discuss his view of Bill Richardson's decision to back Obama. WASHINGTON (CNN) - Clinton campaign adviser James Carville said Monday that he stood behind his controversial weekend comment that compared Bill Richardson's decision to back Barack Obama to the betrayal of Jesus by Judas – a statement the New Mexico governor termed "gutter tactics." "He quoted me accurately and in context," Bill Clinton's 1992 campaign manager told Wolf Blitzer on CNN's The Situation Room. "I think the statement had the desired effect. It was what I said." Carville, a former Clinton White House adviser told the New York Times Saturday that Richardson's endorsement "came right around the anniversary of the day when Judas sold out for 30 pieces of silver, so I think the timing is appropriate, if ironic." On Monday, Carville said he hadn't spoken with Hillary Clinton about Richardson's endorsement, but that he was outraged by the development, given the New Mexico governor's history with both the New York senator and her husband, former President Bill Clinton. Richardson served in two different cabinet positions under President Clinton, and watched this year's Super Bowl with him. Carville's latest comments came hours after Clinton spokesman Howard Wolfson told reporters that he would not have made the remark, and would have apologized for it. But Carville, a CNN commentator, was unapologetic, telling CNN he knew the impact his words would have. "I doubt if Governor Richardson and I will be terribly close in the future," he said, but "I've had my say....I got one in the wheelhouse and I tagged him." 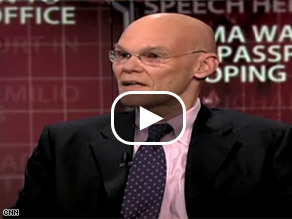 Related: Watch the entire Carville interview. Carville is a great example of everything that's wrong with politics. I don't think that Obama is a saint in this regard, but everything I've learned about him tells me he'll be better. That's why I support him. I've respected Carville's opinions in the past because his opinions seemed considered and he showed a reasonable amount of expertise at what he was talking about. But these comments show him to be a small man whose loyalty to the Clintons has clouded his judgement as to what he should say in public about a figure he might in future have to consider in his capacity as commentator. Just as Halperin's comments about how Edwards described Obama showed Halperin to be a dirty-mouthed flunky and a man of low down, alley-like character whose commentary ought to be taken with a grain of sand, these comments by Carville will forever cause one to wonder whether his future commentary is tinged with Clinton-love and skewed by the Clinton point of view. Any comments he makes about the Obama or McCain campaigns from now on ought to be held suspect as being presented by a Clinton surrogate. So in other words, he didn't do what you wanted him to? How about this novel idea....MAYBE just maybe he picked the candidate he thought would be best for the country going forward. How about that! And the implication that governors and people in power pick a candidate based on what is owed them for the past and not what is best for the country is very scary! Carville, are you concerned about losing your touch? What did you say happened in Charleston, Wva when President Clinton didn't get it- America did not realy like his wife? He thought it was the hair style if I recall the story you told on The Situation Room one day. Question- What came first The Clintons offering Senator Obama the Vice Presidency or the Dr. Wright's tapes? Bill Richardson did betray Hillary. He betrayed her because His state, NM, voted for Hillary and wants her to win more each day. So not to follow the will of his state is unforgivable. Carville: "I doubt if Governor Richardson and I will be terribly close in the future"
Hillary said that she was under sniper fire on her Bosnia trip, the reporters grilled her on it and she stood her ground and said I was under fire. Someone who said he was there with her backed her statement and now I read that her campaign manager said that she misspoke. What a liar? Anybody want to comment on this lie??? No Obama attacks just answer the question, Did she lie? Let's be clear on the facts, Hillary won by a small margin in New Mexico, as she did in most other states that she won. Contrastly, Obama crushes her in the states that he wins. Barack Obama won the most delegates in Texas. Anyone who believes Bill Richardson is somehow wrong here, needs to really take a good long look at themselves. If you find yourself suddenly hating someone as amazing as Bill Richardson, the problem is with you, not him. Carville, used to be brilliant; he has turned into an unstable sociopath. Bill Richardson is no Judas, he is his own man and the Clintons couldn't pursuade him to see things through their distorted eyes. The Clintons apparently did earn his loyalty. They have only themselves to blame, but I won't hold my breath waiting for them to accept the blame for anything. As a Christian, I am insulted that "Hateful Hillary" was even remotely compared to Jesus. I not only think Carville should apologize to Bill Richardson he should apologize to all Christians. This is worst than anything Pastor Wright said.